browse and download over 40 fractal worlds and 3d landscapes. original high resolution color poster prints and custom murals are for sale. seattle, wa gallery offering contemporary art. the gallery was the first to show work from the studio glass movement. the gallery also represents major painters, sculptors, and ceramic artists. private gallery specialising in aboriginal art. gallery information, artists, exhibitions, and stockroom. melbourne. on-line gallery of over 30 artist members of the washington, dc co-operative gallery. specializing in unique and innovative fine art in all media. a 30 year old, non-profit cooperative gallery. information about schedules, membership and reproductions of paintings by gallery artists. dallas, texas gallery devoted exclusively to photography. this large art gallery site features over 200 photographs on over 200 pages. 6 bayview gallery camden, me. camden, me. gallery offering paintings, prints and sculpture by contemporary new england artists. the gallery has a second location in portland. atlanta, ga gallery offering american craft gallery with an emphasis on clay, metal, wood, fiber, and glass. st. simons island, ga gallery featuring contemporary landscapes & still-lifes. the gallery is also an agent for portrait brokers of america. san francisco, ca gallery representing emerging and internationally exhibited artists who reflect the non-objective and conceptually based program of the gallery. Australias premier gallery of panoramic photography. Extensive Panograph gallery, stunning landscapes of Australia, books, posters, and CD-Extra. monticello, il gallery specializing in the works of linda nelson stocks and peter sculthorpe. gallery also provides a full range of custom framing services. Cutting edge photography gallery in the heart of New York City. Curated by Liesl Eisenbeis, this gallery features the work of emerging photographers. downtown gallery representing fourteen artists. offers artist profiles, gallery news, hours of operation, contact information, and related links. san francisco, ca. gallery is primarily known for its strong stable of living academic realists, the gallery also presents significant works from the late 19th and early 20th centuries. granite bay, ca gallery that features original works by artists from the northern california region. in addition, the gallery handles limited edition prints, custom framing and commissioned pieces. a boston gallery owned by art consultant crystal duell. the gallery displays paintings, photography, fine prints, and sculpture by several different artists. london, england gallery encouraging young artists as well as dealing in more established names. today the gallery represents over 20 contemporary artists. Belldandy and Skuld galleries, OVA gallery, post card book, art book scans, and cover gallery. norristown, pa contemporary art gallery featuring art by local and nationally based artists. pagus is a non-profit gallery. international gallery for modern and contemporary art. the gallery organizes exhibitions with painting, sculpture, photography, video and installations in its space in brussels and regularly participates in international art fairs. gallery jones is a contemporary art gallery exhibiting canadian and international painting, sculpture and photography. artists include cole morgan, otto rogers, volti, luke dougherty. assiniboia gallery features quality original works of representing regional and national artists. contains gallery profile, current exhibitions and mailing list. 29 thomas mccormick gallery chicago, il. chicago, il. gallery showing 20th century works of art, the gallery represents the estates of both important and newly recognized artists along with a contemporary program of established and emerging painters, sculptors and printmakers. artists include: anna kunz, gary gissler, yee jan bao, bill barrett, darrin hallowell and robert natkin. gallery of recent photographs of traverse city state hospital. edmontons largest public gallery. schedules, events, classes. Supplies a biography, photographs and an extensive art gallery of the artist. If the business hours of megart virtual art gallery in may vary on holidays like Valentine’s Day, Washington’s Birthday, St. Patrick’s Day, Easter, Easter eve and Mother’s day. We display standard opening hours and price ranges in our profile site. We recommend to check out megart.com for further information. 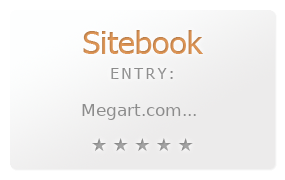 You can also search for Alternatives for megart.com on our Review Site Sitebook.org All trademarks are the property of their respective owners. If we should delete this entry, please send us a short E-Mail.